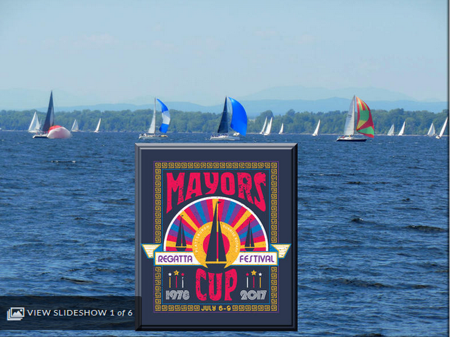 Plattsburgh officials have announced details of the 40th annual Mayor’s Cup festival and regatta..
Plattsburgh’s center city area has become a hub for what’s referred to as landlubber activities, with events like outdoor concerts, yoga, farmers markets, and theatre; bike rides, a fire truck pull, disc golf and fireworks. After being presented with an official Mayor’s Cup t-shirt, Mayor Colin Read praised the diversity of events and organizations involved. “Festivities are actually beginning as early as July 1 for this to celebrate Canada’s 150th birthday on that Saturday and is going to continue right on through the 9th and through the culmination with the official Mayor’s Cup regatta. I really encourage everybody to come down because this is really one of the first and best examples of a true private-public partnership. It’s going to be just so much fun. And it’s going to really hearken back to Mayor’s Cup of years past.